What have your mornings looked like recently? For the past month or so mine have been pretty strange. I wake up, take 3 steps over to my kitchen (perks of living in a 300 sq ft apartment), down a glass of water, and then shove a tablespoon of coconut oil into my mouth to swish around for 20 minutes. My husband found it super attractive the first time I tried it; oil dribbling down my chin, gagging when I finally got to spit it out into the trash, and choking on the salt water gargle afterwards. But I embarked on this weird morning ritual after I spent a full day reading up on research articles listing multiple benefits this habit can provide. Here’s what I found. I use coconut oil for its antibacterial and microbial effects (plus I much prefer the taste of coconut oil). 1. Upon waking up, and on an empty stomach, drink a full glass of water. 2. 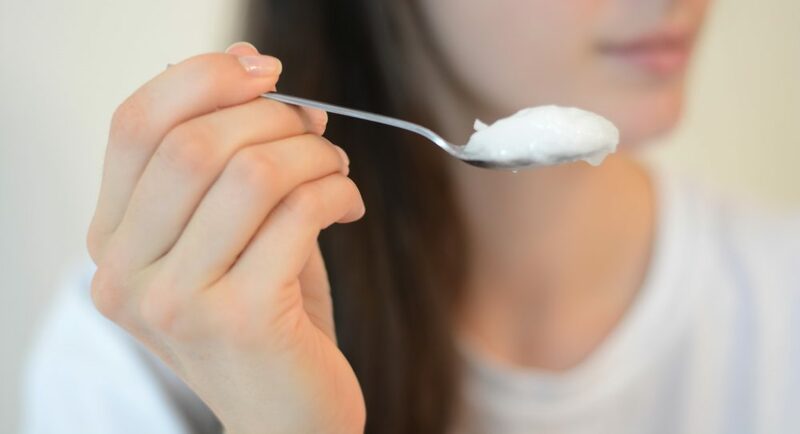 Scoop out a generous tablespoon of coconut oil and place it into your mouth. You may need to chew a bit to liquefy the oil, depending on the temperature you keep it at – this part is weird. 3. Swish the oil around in your mouth, periodically pulling through your teeth, for 20 minutes. You don’t need to go nuts, 20 minutes is a long time so pace yourself accordingly. It will get thicker as it accumulates more bacteria filled saliva, that’s normal (and a bit gross). 4. Spit the oil out in the trash can (don’t spit it out into the sink as it can solidify in cold temperature and clog your drain). 5. Rinse your mouth out with warm salt water. So I’ve been doing this for a month now, albeit not entirely consistently at the start (it’s a bit tough to stomach at first and took me a while to get into). While I don’t have a lab to prove the asserted detoxifying benefits personally, I can tell you that there are quite a few research articles that attest to the reduction of free radicals and toxic and carcinogenic chemicals in persons who partake in oil pulling. I am inclined to believe that it aids in killing off harmful bacteria and pulling out toxins, but I’m a sucker for detoxing and at the very least it’s an added bonus to all of the other health benefits. 1. Fresher breath. After about a week I noticed my morning breath was significantly less terrible. Somewhere between all of my coffee drinking and increasing age my mouth seemed to be getting less and less fresh in the early morning, so it was a huge bonus to find that oil pulling was a serious cure for that. 2. Headache cure. Or I could say hangover cure – whether my occasional headaches were induced by too much wine or not, I felt 100 times better after my oil pulling ritual. Which seems weird because the least appealing sounding thing when you’re feeling nasty is swishing oil around in you mouth. Between this and my facial roller I’m set. 3. Whiter teeth. My two front teeth are always white since they’re veneers (long story short, when I was 11 I knocked out my two front teeth at an Irish Dance competition by fainting head first off the stage into the concrete floor) but the rest of my teeth need a little TLC to keep up the pearliness. A month into oil pulling and they seem a tad whiter to me (kicking myself for not taking a before and after shot). 4. Decreased tooth sensitivity. My teeth are usually pretty sensitive, and I’ve noticed that extremely hot and cold beverages don’t cause as much pain as before. This has to be from the oil pulling because nothing else in my routine has changed, I still use the same toothbrush brand and the same Sensodyne toothpaste. 5. Productivity boost. This is a personal benefit that I just had to throw in the list. I usually eat breakfast within minutes of waking up, and then I sit around for another 30 (sometimes an hour on my days off) trying to convince myself to wake up. With oil pulling, I need to stay busy for 20 minutes. So I hop in the shower, get dressed, put on a pot of coffee, make my breakfast, and set up my work station for the day. It also gives me the time to make healthier and more time consuming breakfasts, like steel cut oats, which I usually don’t have the luxury of eating fresh (I typically prep them on a Sunday night for the week). All in all, this is a cheap and effective home method for boosting not only your oral hygiene, but also your overall health. Make sure to use organic, cold pressed, unrefined oils. I’d love to hear about your experience with oil pulling in the comments below!